Jerusalem, Israel – Melton CEO Judy Mars Kupchan presented the 2018 Florence Melton Award to the Florence Melton School of B’nai Torah Congregation in Boca Raton, FL. 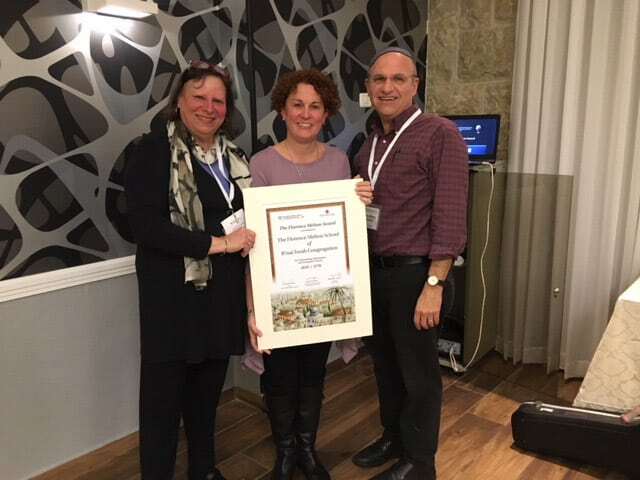 She presented the award on the opening day of the 23rd Annual International Directors Conference, held Jan. 15-20, 2018, in Jerusalem. Penina Bredoff, Director of Melton at B’nai Torah Congregation, accepted the award on behalf of the congregation, which honors one Melton school from the worldwide network that models best practices and exemplifies the high standards of the Florence Melton School of Adult Jewish Learning. The award was established in 2009 to memorialize founder Florence Melton, z”l, and to provide a cash award to one Melton School whose accomplishments are stellar. This year the award is especially significant, as B’nai Torah Congregation was Florence Melton’s congregation, and Rabbi David Steinhardt was a teacher and close friend of the late founder. It was Rabbi Steinhardt who took on the challenge of reviving the school when it was closed in the community. Melton’s new home at B’nai Torah Congregation has given new life to the school and new learning opportunities to hundreds of adult learners in the Boca Raton area. In addition to the cash prize, the Florence Melton Award also includes an opportunity for a learning event in the community, sponsored by the Gordon Zacks Chair of Learning and Leadership. The Florence Melton School of Adult Jewish Learning, a project of the Hebrew University in Jerusalem, is found in 40 communities globally. 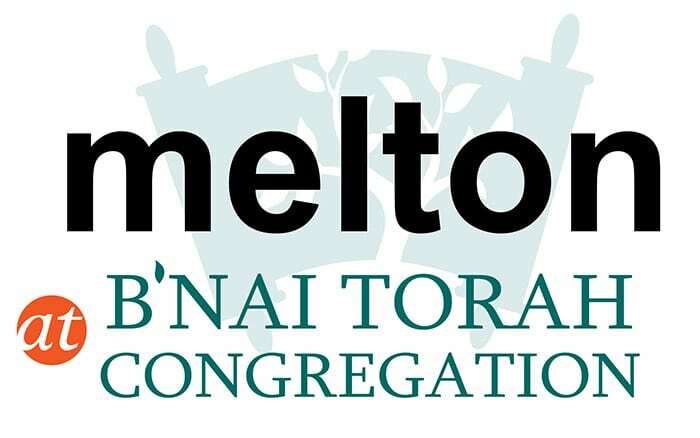 B’nai Torah Congregation has sponsored Melton’s high-quality adult learning for the past four years, and provides classes from the Melton Scholars Curriculum for graduates as well. As a pluralistic, non-denominational program of study, B’nai Torah Congregation is proud that 35 students will graduate from Melton this May, representing congregants from many different congregations as well as the unaffiliated throughout the community. In the past four years, 46 Melton classes have been offered and more than 250 students have attended classes each year throughout the community at B’nai Torah Congregation, Congregation B’nai Israel, and The Adolph & Rose Levis Jewish Community Center. The annual International Directors Conference brings directors from around the world to enhance professional development, share best practices, and grow Jewishly. 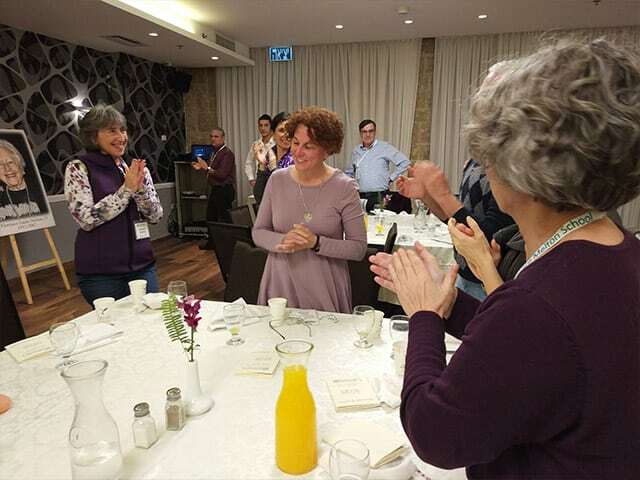 This year’s conference focused on “Social Justice in Zion” and featured workshops and networking designed to support the growth and sustainability of Melton schools, presentations by rabbis and scholars, and first-hand encounters with social justice efforts and leaders in Israel. For more information, please contact Penina Bredoff at melton@bnai-torah.org, or register for classes at www.events.org/MeltonBocaRaton. 2018-19 Fall schedule of classes will be released this spring. Directors and staff of the Florence Melton School of Adult Jewish Learning honor Penina Bredoff (center), who directs the Melton School at B’nai Torah Congregation. The school is the recipient of the 2018 Florence Melton Award. Penina Bredoff (center) accepts the Florence Melton Award from Judy Mars Kupchan, CEO for the Florence Melton School of Adult Jewish Learning, and Rabbi Morey Schwartz, Melton Director of Education.